Here is the recipe I go by when making my green smoothies. Green smoothies may look weird and sound weird to some people but before you start to think it will taste too much like salad in a cup, don’t worry:) the fruit in it sweetens it up and I always add fresh lemon juice which helps to cut through the “green taste” of the drink. This is an amazing way to pack your morning with so much fibre! in the whole recipe there is approximately 20g of fibre! (it is recommended to have 30g per day). Fibre is a great way to keep your bowels healthy, intestinal flora thriving and keep you feeling full. 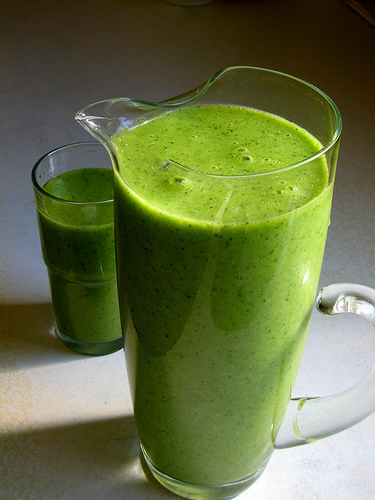 This smoothie is also a great way to increase the mineral content in your diet. Greens are a great source of bioavailable magnesium, calcium, potassium and iron. Perfect for healthy, shiny hair, smooth, clear skin and strong nails! Protein is another essential nutrient found in this meal in a cup! Greens are a better source of protein than steak when comparing them calorie for calorie. Many many many other nutrients, phytochemicals and enzymes are found in this drink and you will discover so many benefits for yourself including improved digestion, elimination, toxin removal, liver function and clearer skin too. – 1 .5C of filtered water. Put the water and greens in your blender and blend till liquid. Add the rest of the ingredients and blend. Will make around 800ml to 1Litre. I also like to make this the night before and put in my protein shaker bottle in the fridge to grab the next morning when I’m heading out the door. « . :8 Reasons why your daily coffee doesn’t have to be a secret shame!